What a cold January this is shaping up to be. I'm not all that upset because I've got my cooking mojo back, and I like spending time in the kitchen when it's snowing outside. This week I tried three new recipes. Each one was a winner and has been pinned to my Pinterest Recipes: Tried and Liked board. I will definitely make these again. I've snagged the photos from the websites mentioned, and you'll find the recipes by clicking the links or visiting my Pinterest board. Note that I made changes to some of the recipes, so you might want to take a moment to see what I did. 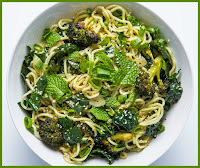 Cold Sesame Noodles with Broccoli and Kale (from Bon Appetit): I tried an experiment this week, which was to cook something on Sunday that was specifically meant for our lunches. This cold noodle dish was so good, we both looked forward to noon. I recommend this dish for lunches, but I think it'd also be good for a summer dinner or to take to a potluck. I didn't have sambal oelek, so I used hot red pepper flakes, though any hot sauce would have worked too. I used spinach instead of kale because we were having kale with a dinner during the week and I wanted a different green. I used soba noodles instead of ramen because we like them better. I left out the mint because I forgot to buy it. I don't think I'd use it, though; the dish was perfect as it was. Tuscan Chicken with White Beans and Kale (from Cooking Light): I love one-dish dinners, and this quick-cooking chicken dinner was so easy to make. I used one of my large cast-iron skillets and had dinner on the table in about a half hour. This was just as tasty on the second night. The only thing I changed in this recipe was to use dried thyme. I didn't like the look of the fresh in the grocery store, and I was too lazy to see if there was any still growing in the garden. Oh and I added a handful of chopped grape tomatoes to the skillet just to use them up. Note too that I had to cook my chicken about 8 minutes at the end, instead of the suggested 4 minutes. Roasted Vegetable Pasta with Walnuts and Sage (from Diabetic Living): Although neither of us is diabetic, I like looking through this magazine for its nutritious recipes, which are perfect for any healthy lifestyle. I almost always find something I'd like to try. This recipe involves a few pots and pans, but the results were well worth the cleanup. It was so warming and perfect for a winter night. Plus it's vegetarian and surprising low calorie. First, I served it over brown rice because we had been eating noodles for lunch, and I really wasn't in the mood for more pasta. Second, I didn't use the low-fat cream cheese called for in the recipe. I had a little light cream I wanted to use up, so I stirred that into the sauce instead. Finally, I had about a quarter cup of white wine to use up, so I threw that in there too. I'm not sure this added very much to the final dish, but I was happy to get that bottle out of the refrigerator! Hope at least one of these recipes catches your eye! 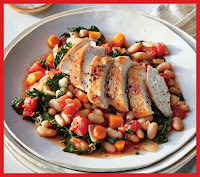 I've posted a Diabetic Living magazine recipe this week. The recipes you have posted look delicious! Cooking lunch ahead of time is a radical idea! All of those sound like winners and I like the substitutions you made with spinach in the cold noodle recipe. It's always nice to bin the kitchen when it's cold outside. Heats things up and there are the great aromas, all while having fun baking or cooking. They all look good to me. The vegetarian one is the one that looks the best and is the one I'm most likely to try. I'm looking forward to trying all three of those! And would also sub in soba noodles, as that is what I have and like them a lot. 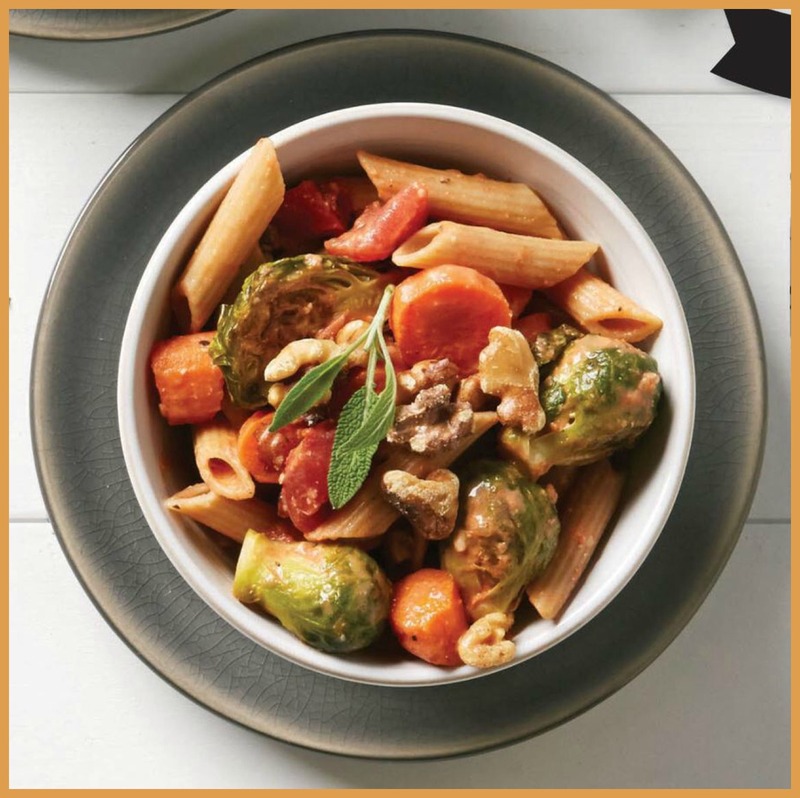 My post is all about Cooking Light- this month's issue has a lot of recipes I want to try. 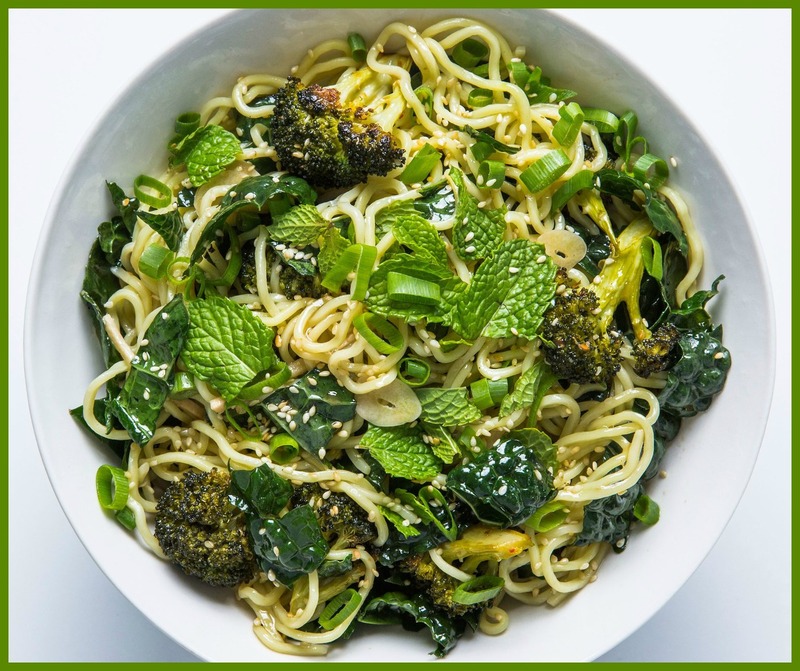 I am intrigued by the noodles with kale, not a huge fan of cold noodles but it sounds good. I have a bag of sweet potato noodles (gluten free) at home that would work. Thanks for this look at 3 recipes and how you tweaked them. I often add or change to a recipe based on what I have on hand. I would never have had sambal oelek, but always have red pepper flakes or sriracha. Nice to know the spinach worked instead of kale. I can't get my tongue to embrace kale, since trying a salad at Old Chicago. It was bitter! Maybe that changes with cooking it?? All three recipe sound wonderful, and I like the changes you have mentioned. Thank you for hosting!